Ringworm thrives in dust, pet dander and moist, dark places in the home. On occasion, it may be necessary to rid the home of ringworm, especially if a household member or pet has a ringworm infection. Ringworm is a fungus that causes skin infections, and ringworm is contagious. You must remove ringworm and the habitats where fungus thrives in the home. In order to keep your family and pets safe from infection, you may have to use commercial-grade cleaning supplies or services. Remove pet dander and hair from carpets, furniture, bedding and floors, using a pet vacuum, roller brush or other pet hair removers. According to the University of Illinois College of Veterinary Medicine, only 3.3 percent of the ringworm that infects humans comes from the same ringworm that infects cats and dogs. Yet, in 30 to 70 percent of households in which a cat has a ringworm infection, the humans in the household become infected. In any event, the numbers show that infection is possible between humans and pets, so remove pet and human hairs from all textiles in the home. Prepare a cleaning solution of 1.5 cups of bleach per gallon and clean all floors, stair railings, cupboards, bathrooms, kitchen surfaces, doorknobs, countertops and other non-porous surfaces. Some surfaces may require the use of all-purpose bleach that is safe for porous surfaces, yet strong enough to kill a variety of fungal organisms and bacteria. Look for cleaners that have an EPA-certified label, which is the label that Environment Protection Agency approves for use in ridding pathogens and bacteria. Place some of your household items outside on a sunny day. Pet cages, shoes and laundry baskets are some of the household items that you can leave outdoors on a sunny afternoon to rid them of ringworm. Dr. John Angus, a veterinary dermatologist at the University of Illinois Veterinary Teaching Hospital, says that ringworm thrives in dark places and sunlight will kill ringworm. Open your blinds or curtains on a sunny day and let the sun's rays kill the infectious spores in your home. Vacuum your home and throw away the vacuum bag each time you use the vacuum. If you have a bagless vacuum, soak the removable vacuum cup in a solution of bleach using 1.5 cups per gallon of water. Wet a cloth in the bleach solution and wipe off the outer compartment of the vacuum. Refer to the vacuum's operators' manual for additional cleaning and maintenance of your vacuum cleaner. Clean your ducts and vents or use professional duct-cleaning services. Vacuum ducts and radiators in every room of home. Wipe down the vents using the bleach solution of 1.5 cups per gallon of hot water. You may require a duct-cleaning service if your ducts are particularly dirty. Professional services use specialized tools and sealants that can clean mold, bacteria, fungus and other spores in the heating and cooling system of your home. Hire a professional carpet-cleaning service to remove ringworm from the carpet. Ringworm can live up to two years in carpet fibers. 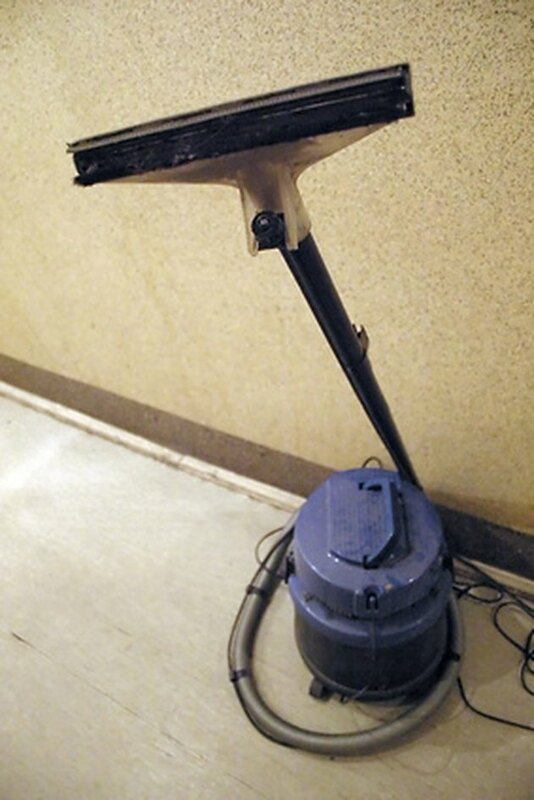 Most carpet steamers available on the market for home use do not get hot enough to kill ringworm and steamers create humidity, an atmosphere where ringworm thrives. If your budget allows, use professional services that offer dry carpet cleaning. Dr. Keith A. Hnilica from the University of Tennessee says it is better to steam clean if you must, as the benefits of removing organisms outweigh the temporary increase in humidity in the home. Take your shoes off at the door when entering the home. As Dr. Richard Olsen from UCLA points out, your feet are the reservoir of fungus and ringworm can easily make its way into the home on your shoes. Keep slippers by the front door so you have something to wear around the house. Rotate your plants in the home and disinfect the areas where your plants sit. If you have a diseased plant, remove it from the home and disinfect the counters and walls around the location of your plant. For artificial plants, disinfect the leaves with a bleach solution. Keep stock of basic supplies at home for quick remedy. Check your stock frequently for basic yet necessary supplies such as lint rollers, rags and vacuum bags. Keep lint rollers and pet hair removers clean. Remove hair, dust, lint and other debris after each use. Do not use ammonia for ridding ringworm from the home. Ammonia does not kill all forms of ringworm. Do not mix bleach with other household cleaners, especially ammonia. The fumes may be fatal.